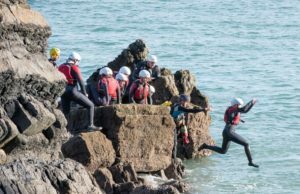 Coasteering is a relatively new activity and was first popularised in Pembrokeshire which is where we have a partnership with the National trust to provide all their Coasteering from Stackpole Quay. We are delighted to be offering this exhilarating activity locally in Ceredigion for 2019. It involves swimming, climbing and of course jumping. It is an exhilarating sport led by our highly experienced instructors. 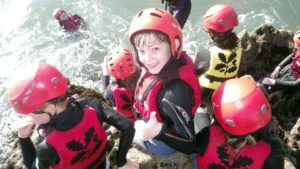 Wetsuits, helmets and Buoyancy Aides are all provided. There is a minimum age limit of 8 and participants are expected to be water confident and competent.